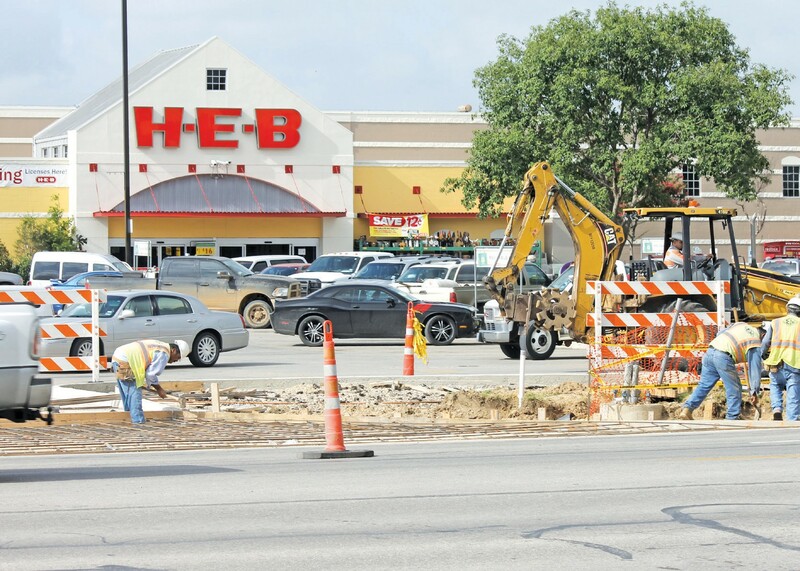 Recent foundation work on new entrance to Pleasanton H.E.B. Soon, a stop light will be erected at the entrance that is aligned with Reed Street. While driving around the H.E.B. store in Pleasanton, one can’t help but notice all of the activity taking place at that location. The store is progressively engaged in a huge expansion program. 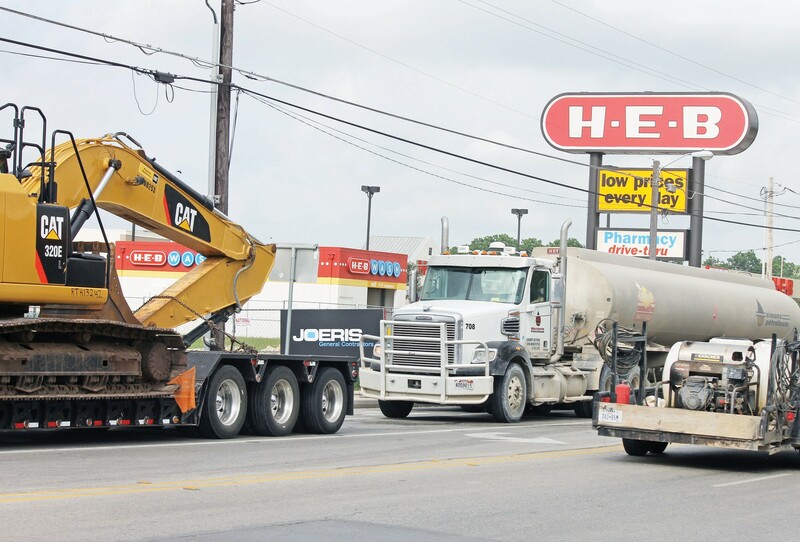 One of the reasons is the growing amount of shoppers at H.E.B due to a tremendous influx of customers from Eagle Ford Shale development. Aubrey Smith, Unit Director of H.E.B. in this city said, “We just ask customers to please be patient as we work through our construction phases inside and outside of the store. In its initial phase of expansion, work is now in progress on an enlarged fuel station at the east end of the H.E.B property. The current contractor for the fuel station project is Joeris Construction. Aubrey said, “When completed, the new fuel station will have capabilities of twelve vehicles being fueled at the same time. The fuel station is being added this year and the building construction will begin in early 2014. “The car wash will remain in the same location, but the entrance to it will change slightly. Aubrey continued, “Our expanded H.E.B. Store will grow, roughly, one and a half times in size. “We are looking forward to larger, expanded departments that will be more spacious and have more variety, as well as additional check stands that will allow for more room for shopping. Also, there will be a seating area for customers who would like to have lunch with us. “We will gain ample space between the check out area and end caps. Additionally, there will be space added between the check stands and the rest rooms to eliminate congestion in this area. Aubrey said, “The new entrance that was constructed recently will include a stop light to allow customers easy access to enter and exit the parking lot. The 281 entrance will reopen in about a month. “Today, we have a very high traffic intersection and we know customers experience inconveniences daily, so the addition of this stop light will be wonderful for everyone! It is aligned with Reed Street. “Property west of the H.E.B. building will be utilized for additional parking in order to better accomodate customers. 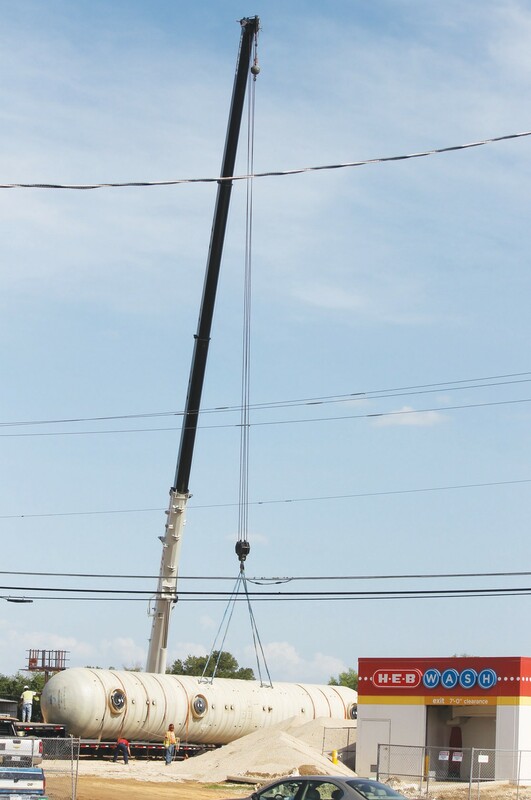 Crane preparing to hoist fuel tank to be lowered into position, underground, at Pleasanton H.E.B. Bob Heffley, Construction Manager for Joeris, at new, enlarged fuel station location on H.E.B. property. He’s discussing work progress with Aubrey Smith, H.E.B. Unit Director. Eagle Ford Shale oil field activity has increased business at H.E.B. in Pleasanton.